According to his Web site, best-selling author Paul Hawken “has written six books” — many of which outline in considerable detail how corporations should promote a green or environmentally sustainable form of capitalism. 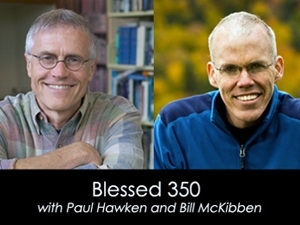 Yet considering that his most recent book is titled Blessed Unrest: How the Largest Movement in the World Came into Being and Why No One Saw it Coming (Viking, 2007), it is ironic that Paul Hawken has his own significant blind spot; as his otherwise comprehensive resume (which is thirty pages long) has only recently been updated to mention the fact that he has actually published seven, not six, books, although the title of his first book still fails to make it onto his resume. At first glance it would seem strange that someone could forget the publication of their first book: a book that Paul traveled half-way across the world to write, but arguably there might be a very good reason why he has expunged any mention of The Magic of Findhorn (Souvenir Press, 1975) from his past. No doubt this is because this book provides an uncritical celebration of New Age spirituality that glorifies intuitive thinking; supporting ideas that do not mesh well with his subsequent, ostensibly secular, efforts to reform the corporate world. Yet, as this article will demonstrate, despite his decision to underplay his more irrational literary endeavors there is plenty of evidence to suggest that Paul continues to work closely with the New Age community in his futile efforts to create a more loving, spiritually-enlightened, capitalism. The Integral Institute’s Michael Lerner likewise serves alongside Paul and Daniel Goleman on the advisory council of the Center for Contemplative Mind in Society, a center whose long-serving executive director, Mirabai Bush, is co-author, with Ram Dass of the New Age book Compassion in Action: Setting Out on the Path of Service (Random House, 1991). Arthur Zajonc, the secretary of the Center for Contemplative Mind in Society, is similarly positioned in the heart of the US New Age community, as he is the former general secretary of the Anthroposophical Society in America (1994-2002) and president (since 1997) of the Lindisfarne Association. Founded in 1972, Lindisfarne, whose work is closely related to that of Findhorn, refers to itself as “an association of scientists, artists, scholars, and contemplatives devoted to the study and realization of a new planetary culture.” Elite power-brokers have been involved in Lindisfarne from its not so humble beginnings, with their founding advisory board including the then-editor of The New York Times (Harrison Salisbury); while when Lindisfarne moved to Colorado (in 1979) it was Canadian businessman Maurice Strong who stepped up to the mark to help finance the move. Here it is important to introduce Nancy Wilson Ross, a woman whose keen interest in Asian spirituality and art led her to write numerous books that played a critical role in introducing Buddhism to Western readers, her two earliest contributions being The World of Zen: An East-West Anthology (Random House, 1960) and Three Ways of Asian Wisdom (Simon & Schuster, 1966). Ross was a bona fide member of the ruling class and served as a founding board member of John D. Rockefeller III’s world-famous Asia Society (a position she maintained from 1956 until 1985). Moreover, it was through her connections to the Rockefeller clan that she initially brought the writings of Lindisfarne founder William Irwin Thompson to the attention of Laurance Rockefeller — who then proceeded to help Thompson launch Lindisfarne on its merry way to global fame. Ross, who was a member of the Zen Center in San Francisco, also ensured that the Zen Center worked in close association with Lindisfarne, a Zen Center that counts Paul Hawken among its long-serving members and major benefactors. It seems that Paul has always worked hard to prove that spiritual and environmental interests are compatible with capitalism. For example, in 1966 he founded the United States’ first natural food company (Erewhon Trading Company), and in 1979 was the founder of Smith & Hawken — which was the first company to participate in a debt-for-nature swap in partnership with the free-market environmental outfit Conservation International (of which Paul has served as a board member). More recently, in 2002, Paul created the Natural Capital Institute (now known as WiserEarth); in 2005, he co-founded the Highwater Global Fund, a leading environmental and social global public equity fund; and a few years ago (in 2009) he co-founded a solar research and development venture called OneSun Solar. Alongside Paul, the other co-founder of OneSun Solar is biologist Janine Benyus, who is a board member of Natural Capitalism Solutions, a group whose stated “mission is to educate senior decision-makers in business, government and civil society about the principles of sustainability.” Founded by Hunter Lovins, this latter organization is based on the principles presented in a book she co-wrote with Paul and her husband Amory Lovins entitled Natural Capitalism: Creating the Next Industrial Revolution (Little Brown and Company, 1999). A particularly notable member of the Gund Institute for Ecological Economics is the winner of the 2008 Buckminster Fuller Challenge, John Todd. (3) Todd is a fellow of both the Findhorn Foundation and Lindisfarne Association, (4) and is the author of two natural wastewater treatment patents with Findhorn Foundation chairman Michael Shaw. Todd likewise resides with Paul Hawken and Amory Lovins (among others) on the advisory board of an entrepreneurial non-profit organization known as Sustainable Settings. One of the two emeritus directors of Sustainable Settings is Ben Walton, who is a board member of the right-wing Walton Family Foundation. They none-too-mysterious connections keep piling up, and Paul is counted as a member of the international advisory board of the Women’s Earth Alliance, which is a project of the late David Brower’s Earth Island Institute. Here Paul is accompanied by deep-green eco-philosopher Joanna Macy, who is a patron of the Findhorn-connected WYSE International and serves on the council of sages of the California Institute of Integral Studies; (5) and they are joined by controversial environmental activist Vandana Shiva, who is an associate of the Gaia Foundation — a group that was co-founded by Findhorn Foundation trustee Edward Posey OBE and Findhorn Foundation fellow Liz Hosken. Likewise, Paul maintains ties to other deep-ecology activists through his presence on the advisory board of the Green World Campaign, which promotes “holistic ways to work for the health of our shared biosphere and the harmony of our global village.” The most significant fellow advisor to the Green World Campaign is philanthropist, Peter Buckley, who is the former CEO of Esprit-Europe, board member of Doug Tompkins’s Conservation Land Trust, co-founder of the Center for Ecoliteracy, and founder of the David Brower Center. Finally, Paul serves on the advisory board of the Center for a New American Dream, which aims to help Americans “to reduce and shift their consumption to improve quality of life, protect the environment, and promote social justice.” Other spiritually-interesting members of their advisory board include Hunter Lovins, Joanna Macy, and Norman Myers, who is a former member of the Auroville Foundation’s international advisory board (for critical comment, see footnote #5).